Mouse-sized mammal had gliding membranes and a unique inner ear. This image may be used by news outlets to accompany this Inside Science story, with credit given to its creator. (Inside Science) -- Newfound fossils of an ancient gliding mammal add to evidence that mammals began evolving a diverse array of forms well before the end of the age of dinosaurs. These fossils also possess ear bones that shed light on the complex way in which reptile jawbones evolved to become part of the mammal ear. 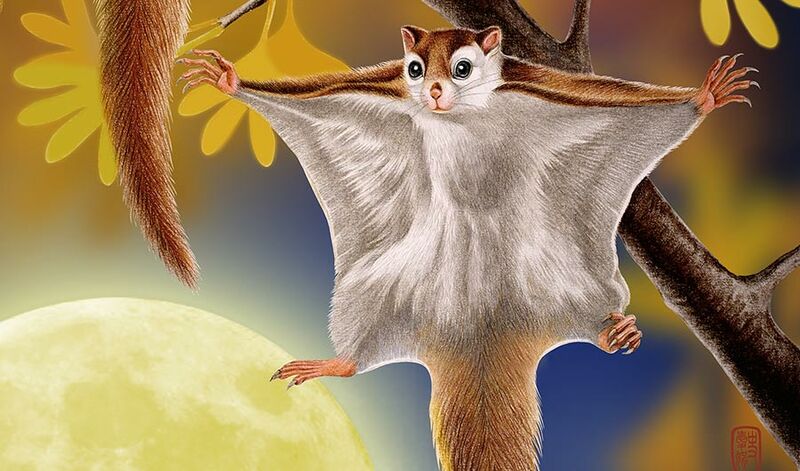 Gliding is seen in at least 64 species of living mammals, including flying squirrels. These creatures rely on flaps of skin between their legs to glide from higher to lower areas. Ropelike muscles along the edges of these membranes help the animals control their flights and hold the skin against their bodies when they are not gliding. The newfound gliding mammal, named Arboroharamiya allinhopsoni, was discovered near Nanshimen village in northern China's Hebei province. Arboroharamiya is from "arbor," Latin for tree, and "haramiya," Arabic for trickster, while allinhopsoni is in honor of Edgar Allin and James Hopson, both pioneers in research into mammalian middle ear evolution. The fossils were found in rock about 164 million to 159 million years old. The scientists analyzed fossils of two mouse-sized specimens of the new species, one of which is a nearly complete skeleton. The fossils included impressions not just of their fur, but also of their gliding membranes. One membrane stretched between their front and back legs; others between the neck and front legs, and the tail and hind legs. And, like many of today's gliding mammals, A. allinhopsoni also possessed a long, bushy tail that likely helped in maneuvering during gliding. Back when these specimens were alive, the area they lived in was likely a warm forest dominated by gymnosperms such as conifers and cycads. Based on their teeth, these creatures likely ate insects, fruits and seeds, said study senior author Jin Meng, a paleontologist at the American Museum of Natural History in New York. All living species of gliding mammal are nocturnal, so the researchers think A. allinhopsoni likely was as well. A. allinhopsoni belongs to an extinct group of mammals known as the euharamiyidans, which were adapted for forest life. They had long tails to help them keep balance and long, slim limbs that would have helped them move from branch to branch and tree to tree. Based on fossil similarities between the new animal and euharamiyidans, the researchers now suggest that gliding was likely common in the group. They added that as forests became dominated by flowering plants instead of gymnosperms, euharamiyidans may not have been able to adjust and thus went extinct. Previous research had discovered three other gliding mammals that also dated from the Jurassic period. These new findings support prior finds suggesting that mammals began diversifying "in the middle of the Jurassic about 160 million years ago," well before the end of the age of dinosaurs roughly 65 million years ago, said Anne Weil, a vertebrate paleontologist at Oklahoma State University, who did not take part in this research. These new fossils also possess the earliest known examples of mammalian middle ear bones, which help conduct sound from the outer ear to the inner ear and include the smallest bones in the human body. Whereas reptiles possess a single bone in the ear and multiple lower jawbones, every living mammal possesses three bones in the ear and a single lower jawbone. Previous research suggested that as mammals evolved from reptiles, several jawbones evolved to become a chain of middle ear bones known as ossicles that help detect high-pitched sounds, likely helping early mammals track and hunt insects in the dark. The shape of each of A. allinhopsoni's five middle ear bones differed from those found in known mammals and their kin. "It is a new type of middle ear that was previously unknown," Meng said. "It raises many questions about how the mammalian middle ear evolved and will stimulate new research on this subject." Scientists had long thought all mammals, from egg-laying monotremes such as the platypus to placental mammals such as humans, evolved ossicles just once in their common history. However, these newfound radically different ear bones join increasing recent evidence that the complex structures of the middle ear actually evolved independently "more than once in mammals," said Thomas Rich, curator of vertebrate paleontology at Museum Victoria in Melbourne, Australia, who did not participate in this study. "I think we'll see that in the next 10 years or so, many more sites in China will continue to show us many new fossil discoveries," Weil said. The scientists detailed their findings online Nov. 13 in the journal Nature.